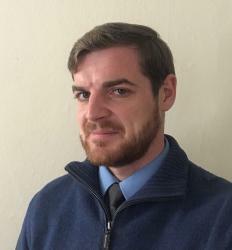 This article is written by Josep Mª Castellá Andreu and translated by Joshua Gregor. It was originally published by RedFloridaBlanca and is republished with permission. Nineteenth-century Spanish constitutionalism is usually interpreted as a pendulum swinging between liberal or progressive constitutions and moderate or conservative ones. This interpretation highlights constitutional instability and the minimal impact of constitutional documents on the nation’s political and social life. French writer Théophile Gautier (1811-1872) described Spain’s constitutional reality very well during his trip there in 1837. 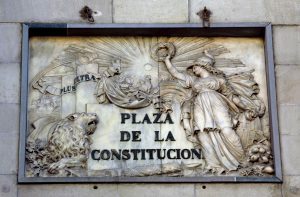 Seeing a square dedicated to the constitution in every city and village, he noted that this was becoming a coat of plaster on a granite building—a reference to the various constitutions’ lack of influence on Spanish politics and society as a whole. The “pendulum” view, though, tends to obscure the fact that conservative constitutions were in force much longer than liberal ones—the Constitution of 1845 during a good part of Queen Isabella II’s regime, and that of 1876 for most of the Bourbon Restoration (1874-1931). The contemporary Spanish state was created in these times, with its great institutions and administration (including the Civil Guard) and the codification of the great legal system. In large part, these positive aspects of the Restoration endure today. 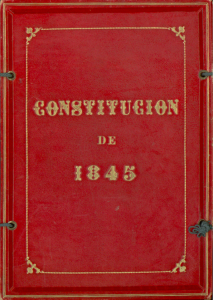 Moreover, as constitutional law scholar Sánchez Agesta (1914-1872) pointed out, 19th-century constitutionalism (apart from the 1812 Constitution of Cádiz) offered a common foundation that was inaugurated with the Royal Statute in 1834 and lasted virtually the whole century, except for the period of the liberal democratic Glorious Revolution from 1868 to 1874. This constitutionalism established a representative and centralized state under the rule of law. Differences throughout the century were mainly among the various constitutional doctrines, which are only partly reflected in the constitutions themselves. Contrasted to national sovereignty we find the shared sovereignty of the Cortes (bicameral parliament) and the King; to rigid constitutions, flexible ones; to constitutional monarchy, limited monarchy. Constitutional ideas flourished in the 19th century, and they were widely debated in the halls of Parliament, the seats of the Athenaeum and journal articles. 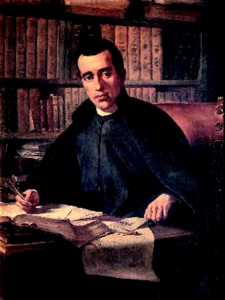 The Catalonian priest Jaime Balmes (1810-1848) was one of the century’s most outstanding commentators, although his work barely spans a decade due to his death in 1848 at the age of 37. Although he did not teach at a university (he had been schooled at the University of Cervera as well as at the seminary in his native Vic), he understood better than anyone else the role of public opinion in contemporary political systems. He wrote tirelessly and created several journals through which he tried to influence politics, particularly moderate parties. He moved to Barcelona in 1841 and to Madrid three years later in order to be near the centers of power. His gaze surveyed a rather tumultuous time in the history of Spain (and of Europe) that spanned more than a decade; in this period the conflict between absolutists or Carlists and liberals came to a head in the first civil war (1833-1839), while the conflict between moderates and radicals played out mostly in the subsequent reconstruction. During this time the Moderate party was created as a vehicle to represent interests and views opposed to attempts to change basic traditional structures; such attempts were made first by the liberal Juan Álvarez Mendizábal (1790-1853), with his confiscation of ecclesiastical property, and later by the progressive general Baldomero Espartero’s (1793-1879) autocracy between 1841 and 1843. Balmes’s failed suggestion of marriage between Queen Isabella II and her cousin Carlos Luis de Bourbon (1818-1861), son of the Carlist claimant, is well-known; he wanted to make this a basis for conciliation between the two sides. Underneath, though, we find in Balmes’s writings an entire constitutional plan for this time period, based on a definite social and political philosophy that originates not from theoretical a priori premises or from simple preservation of the past but from adaptation to the existing social reality. He therefore maintains that political power, parties and the “constitution” should reflect and respond to this reality. Otherwise they will be short-lived and powerless to influence a given political situation—a lasting lesson. Balmes offers an analytical and pragmatic approach to political events. There is no room for resorting to absolutism or to the power of the old estates, but rather for openness to the “spirit of the time” without setting the past aside. Neither does he believe that political solutions involve granting all power to the people; that would be unrealistic. He points out that in Spain the monarchy and the Cortes are two principal elements of continuity, as is Catholicism. Catholic values form the nation’s backbone. On the other hand, the hereditary nobility had been replaced by that of money and intelligence (the bourgeoisie), and this should be reflected in the electoral process (the census and government posts) and in the composition of the Senate. Though Balmes seems to recognize these emerging classes are in the minority, he further recognizes their dynamic and creative nature, which should not be ignored. The predominant social reality of a people bound to tradition should not be ignored, either. Balmes very closely followed what happened in other countries (especially France, England and Italy) with doctrinaire liberalism and representative government taking charge; but rather than copying these, he advocated the continuity and adaptation of the Spanish constitutional tradition, which was recalled in Agustín de Argüelles’s (1776-1844) preliminary discourse to the Cádiz Constitution and is present in the work of theologians and jurists of the Salamanca School. Thus Balmes shares common ground with politician and enlightened writer Gaspar Melchor de Jovellanos (1744-1811) before him and the conservative prime minister Antonio Cánovas (1828-1897) after him—and like his contemporary, the parliamentarian and diplomat Juan Donoso Cortés (1809-1853), so different in other respects, he identifies the true constitution in the internal or historical constitution, which the written constitution codifies. This internal constitution (today we would say material constitution) is made up of the monarch, sovereign but not absolute, and bicameral Cortes that debate legislation and have to approve taxes. This is the basis for the limited monarchy, which is reflected in the 1834 Royal Statute and the 1845 constitution (as well as that of 1876) hailed by Balmes. The written constitution lays out the relationships between the branches of power and can be modified by agreement among them; thus the powers established by the constitution also establish the constitution. There is no pouvoir constituant. What is important for Balmes isn’t so much the written document but rather how well it corresponds to the nation’s actual situation. Here we have a sociological and political concept of a constitution rather than a legal one. This is the limit of his conception of a constitution, which would not be surpassed in continental Europe until the 20th century with the 1918 German or Weimar Constitution and the 1920 Austrian Constitution. Balmes’s constitutional plan also allows for the opposition’s role in controlling government power, for protection of the freedom of the press from government attacks, and for the defense from centralization not only of Basque and Navarrese historical rights, but also of provincialism both generally and in the context of Catalonia in particular. At the same time, he quite clearly rejects independence movements and the application of foreign models of federalism in Spain. Balmes had no promoters in Europe in the 20th century, as Donoso Cortés and his idea of dictatorship had in the German legal scholar Carl Schmitt (1888-1985). The writer and historian of ideas Marcelino Menéndez y Pelayo (1856-1912), however, points out that despite Donoso Cortés’s dazzling eloquence, Balmes’s ideas have aged much more gracefully. The centenary of Balmes’s death was celebrated by Franco’s regime with publications of and about his works, but he was painted as outdated and suspect in the modern democratic age. In 1976, Catalonian classical liberal Professor Lucas Beltrán (1911-1997) placed Balmes in the “Catalonian centrist tradition,” together with the politician and historian Antonio de Capmany (1742-1813), the journalist Juan Mañé y Flaquer (1823-1901), the politician Francesc Cambó (1876-1947) and others. This tradition combines Catholicism with liberalism, respect for Catalonia with defense of Spanish unity, a conservative spirit that values traditions and existing institutions with the need for renewal in the face of stagnation, and idealism with a sense of pragmatism and realism. Balmes’s constitutional ideas can be understood along these lines. Beltrán finished his La Vanguardia Española op-ed (which won the Aznar Prize for journalism that year) with these words regarding the Catalonian centrist tradition: “The young Catalonian politician who wants to be his successor ought to do the same.” The task is still unrealized. At present we can begin by reading Balmes’s essays and finding light—and a method—to guide us in the present time. Josep Mª Castellá Andreu is professor of constitutional law at the University of Barcelona and vice president of the Club Tocqueville.